I love pointy picks, the Jim Dunlop Jazz III and Jazz III XLs in black have been my main pick for several years now. I also fell in love with the new Hetfield Black Fangs after reviewing them recently. the Ultex material on the Black Fangs provided a nice sharp cutting tone, and I love the shape and thickness of the black Jazz III XLs. Jim Dunlop’s NAMM announcement of the new Ultex Jazz III 2.0 makes me very excited. It’s a combination of the things I loved about the Jazz III black, and the Black Fangs. The Ultex® Jazz III 2.0 combines the durability, sharp attack, and light weight of Ultex® with the newly designed hubrid Jazz III sculpted tip. 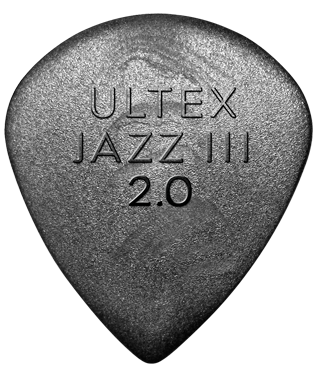 Ultex® gives you the widest possible dynamic range of any pick on the market and will add speed, clarity, and definition to any style of playing. These look like a really nice pick. I will try to get some soon to review. I also hope Jim Dunlop will release an XL version of this.